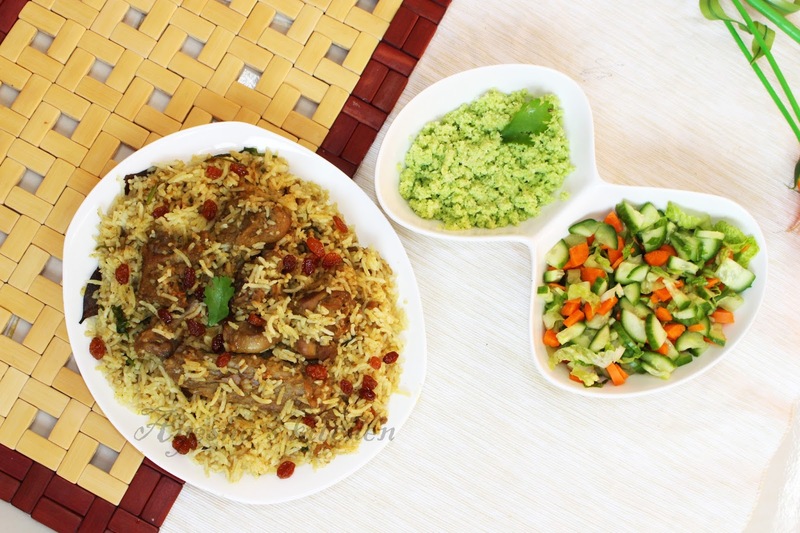 There are many variations in biriyani depending upon the ingredients as well the region. It is considered as a royal dish and has a great role in the menu of royal kitchen. Some of the types are : Chicken biriyani, Mutton biriyani, Prawns biriyani, Quail biriyani, Fish biriyani, Duck biriyani, Beef biriyani, Vegetable biriyani, Turkey biriyani, Mushroom biriyani, Egg biriyani, Chana biriyani, Corn biriyani..etc. 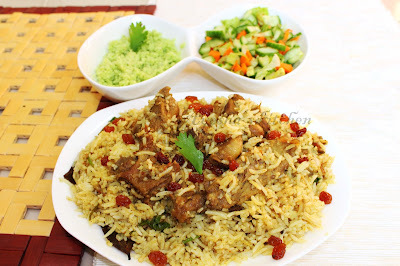 Here is my recipe of Duck biriyani. Do try and enjoy..
Marinate the duck with all the ingredients , as above given for the marination and pressure cook it for 2 whistles. Do not add extra water. When done and the pressure settles down, open the lid and cook in a high flame for few minutes. This makes the gravy thick. When done keep it aside. Mean while you can cook the rice . So heat a vessel and add ghee. Add the cleaned, drained rice along with the raw spices and fry the rice in a low flame for 5 minutes. When done, add 6 cups of boiled water(double the amount of rice). Add some curry leaves and required salt.When it starts boiling , add lemon juice and close the lid. When the water is completely dried, keep the lid open and do not stir the rice when hot or immediately. Let it cool. Again heat ghee in a deep bottomed vessel . Add the garam masala's and then onion. Saute onion till brown and then add tomato. Saute well, when done add the cooked duck along with the gravy. Allow it to cook for few minutes until thick gravy. Now add salt, mint and coriander leaves . Mix well and set aside. Next is to blend the rice and masala. So take a greased vessel, spread some cooked rice, then spread chopped coriander leaves and drops of ghee, a pinch garam masala powder, fried onions and then the duck masala. Again layer the rice and repeat the same process. Finally garnish with coriander leaves and spread some melted ghee evenly. Close the lid tightly . Allow it to cook in very low flame for 10 mins. While serving garnish with fried cashews ,raisins and fried onion. Serve with raita or mango chutney and salad.